Smart meters are being deployed by electric companies worldwide, replacing old, yet functioning analog meters, because it gives them a way to interact with the homes of their customers, monitor electricity consumption, and offer “smart home” control and functionality. Oh, and let’s not forget that they also save money. At least this the big sales pitch they are giving us. By providing detailed information about the energy usage in your home, smart meters can alert you if your new smart refrigerator suddenly becomes an electricity hog and needs to be serviced, if your kids had a party when you were off on a business trip, or if you forgot to turn off your smart stove before you left for work. Depending on the functionality of the meter, the smart meter may be able to track how much electricity is used within each room of the home, as well as how much is used by the various new smart appliances in your house. Just as the smart meters can communicate wirelessly with devices such as TV sets or tablets to show you your electrical consumption, they also communicate this information with the power company, which keeps records about the volumes and patterns associated with your daily life. Below is a video that explores the privacy implications of this data exchange. With this information, whoever has access to the data can get a pretty clear picture of your life: how much time you spend out of the house and at what time of the day; when you watch TV the most; when you are on vacation; if it looks like you’re running a business out of your home; and so forth. The implications for personal surveillance are staggering. Governments, law enforcement agencies, and even companies will be able to access the data housed by the electric company (which the government is already doing to enforce business licenses). The implications are even more serious considering that such intimate personal data about your daily life can be easily intercepted by hackers as it is broadcast over the radio waves. This short video that shows a resident measuring the radio signals sent from the smart meter using microwave radiation. This man decided to make this video because within 3-months of the installation of a new smart meter, the shrubbery around the smart meter mysteriously died, although it thrived around the old electrical meter without any problems and continues to thrive a certain distance beyond the meter. Advocates of smart meters will tell you that the wireless radiation emitted by these devices is within “safe levels,” often referencing ‘decades of research,’ much of which has been funded by the companies that make the smart meters. Unfortunately, many are beginning to suffer with insomnia, headaches and other illnesses after the installation of a smart meter. Are you going to allow the power company to install a radiation-emitting surveillance device on your home? Here’s an interview with a woman from Illinois that refused to have one installed on her house, informed the electric company of her decision by writing, yet was eventually arrested when the police and electric company crew came once again to install the meter on her house. 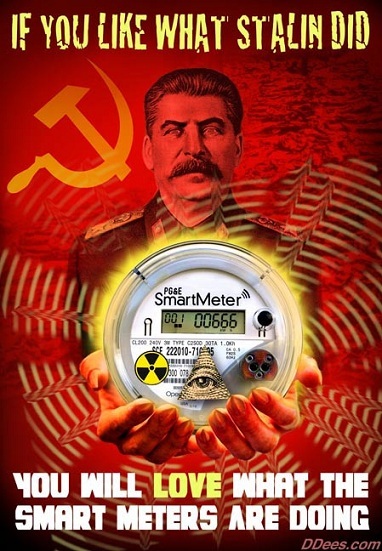 The opposition to smart meters is growing everyday as more people learn about the sinister implications of these devices. In Texas, Republican Senator Dennis Bonnen has threatened to draft legislation that would allow all residents to opt-out from the Public Utility Commission’s smart meter’s initiative. Previous Previous post: Tetanus Vaccine Causes New Disease: New Vaccines Worse?